Tackle the rowing machine for an effective cardio and muscle-toning workout. Once a mainstay of the gym scene, the rowing machine is typically tucked away near a fitness center’s cardio equipment these days. 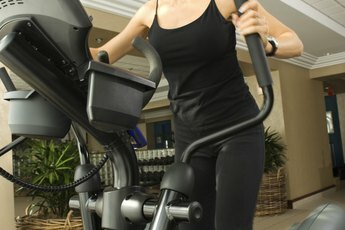 This machine is often bypassed for the more popular ellipticals and spinning bikes. It's time to take a second look, however, as this simple machine offers solid fitness benefits. 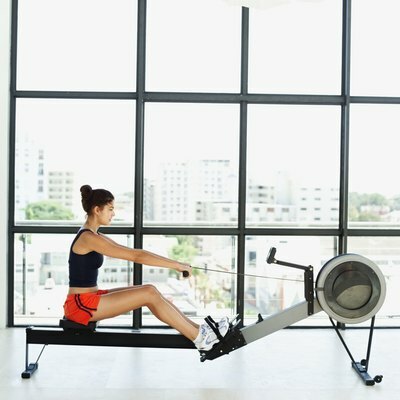 If you’re avoiding the rowing machine because you don’t know how to use it, rest assured that even a female fitness rookie can easily learn the proper form for operating this calorie-blasting machine. After sliding the seat down to the bottom of the machine near the footrest, position yourself on the seat so that your lower back is flush against the backrest. Position your feet onto the pads and wrap the straps tight across the tops of your feet -- the straps should be tight enough to keep your fitness footwear from sliding around while you row. At this point, your legs should be bent. While grasping the handle with an overhand grip, straighten your legs and slide the seat toward the top of the machine. Keep a slight bend at your knees -- even when your legs are extended -- to prevent injury. Pull the handle flush against your body; it should be resting near the bottom band of your sports bra. Lean back just slightly. Memorize this position as this is how you should look at the beginning and end of each stroke. As you move into the “catch” portion of the stroke, your arms should move out first, followed by your upper body and then your seat. Keep your back straight, shoulders pulled back and abdominal muscles tight throughout the entire motion. The torso bends slightly forward during the catch. The catch is followed by the “drive” portion of the stroke, which slides you back into the position you memorized a moment ago, Push with your feet first, then angle your torso slightly back and finish by bending your elbows and pulling the handle back to your body. Trade that oversized T-shirt for more fitted fitness gear while using the rowing machine. 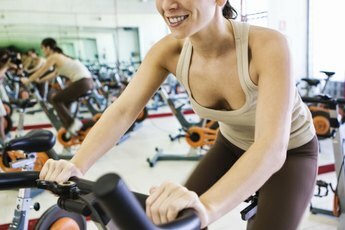 Loose fabrics can get caught in the machine while you’re exercising -- putting you at unnecessary risk for injury. Also, avoid setting the machine at a high resistance while you’re still a rowing rookie -- as you become more comfortable with the machine, slowly increase the resistance to amplify your workout. Once you’ve conquered the rowing machine, take a closer look at the amount of calories you’re burning. According to the Fitness magazine website, rowing at just 24 to 28 strokes per minute can burn around 300 calories in 30 minutes. In fact, Fitness and Shape magazines both recommend rowing as an effective cardio workout that’s easy on your joints -- and a nice change of pace from the tired old treadmill race. It also provides a targeted workout for the legs, abdominals and shoulders. What Part of the Body Does a Rowing Machine Target?